The pen is mightier than the tank? Our very own newspaper, the Newham Adversary, is officially on the streets! Members of East London Against The Arms Fair (part of the Stop The Arms Fair coalition) started to distribute our anti-DSEI paper around Newham to residents and commuters. See Indymedia’s post Disrupting DSEI – Monday to Wednesday for a run-down of the actions at the start of DSEI, including a timeline of the day of action. Below we’ve brought together a stream of posts from Twitter from the day of action, starting at 7am. Pass on this message with final details! 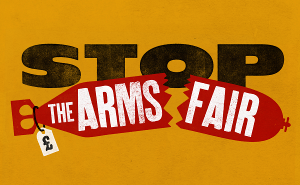 By the people who make DSEI… Download their brochure which includes the exhibitor list and a map of the arms fair.